The nest hollow of the Golden-shouldered Parakeet is excavated in a termite mound still damp from the wet season. Male-yellow frontal band; black crown merging into brown/black hindneck; turquoise face and underparts; abdomen to undertail coverts orange/red tipped with white; brown back and underparts; rump and upper tail coverts turquoise, middle wing coverts yellow; tail brown/green tipped blue/white. Bill grey/white. Eye brown. Female-dull green; forehead pale yellow; crown and hindneck brown/green; rump and upper tail coverts pale turquoise; white abdomen to undertail coverts, feathers on centre of abdomen margined light red; yellow/white underwing mark. As in female; male youngsters with brighter turquoise cheeks; underwing mark present. 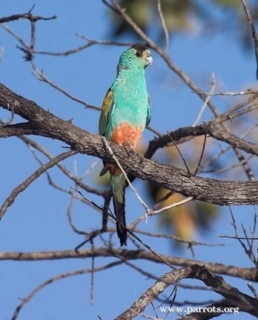 Two note contact call, not as high-pitched as Hooded Parrot. Whistle also described. Vanished and Vanishing Parrots, Forshaw, 2017. Parrots: Their Care and Breeding, Low, 1992. Fairly common in Australia; rare elsewhere. Walk-in enclosure, minimum length 3m (9.8 ft). Mixture of small seeds: canary, millet plus smaller amounts of oats, buckwheat and safflower; limited sunflower; spray millet; green leaves, green peas, fresh corn, insectivorous foods; seeding grasses; rearing food (hard-boiled egg, wholegrain bread and carrot, all ground to crumbly consistency); apple and other fruits if taken. 6" (15cm) square, 10" (25.4cm) high, heated to 70F (21 C). Altered fire regimes have resulted in more woody plants that favour the predators of the parrot, such as the Pied Butcherbird (Cracticus nigrogularis). Local capture of nestlings for trade occurred from the 1950s to the 1970s. NE Australia, with two isolated breeding populations existing on Cape York Peninsula, N Queensland. Found in wet or dry grasslands and open woodland, where there are termite mounds, and areas with Eucalypt and Melaleuca trees. Post-breeding birds may venture into mangroves. Mainly eats seeds of annual grasses such as Schyzachyrium and Alloteropsis. Also consumes Desmodium legumes. Usually found singly, in pairs or family parties, gathering to feed in flocks of up to 30. Roost in foliage in hottest part of day. Pairs form lifetime bonds. 4 to 7 rounded eggs, 21.5 x 18.5mm (0.8 x 0.7 in).